Known as “the spiritual Woodstock of the new millennium”, Bhakti Fest is America’s premiere kirtan and yoga festival. Bhakti Fest will celebrates its 5th Anniversary September 5 – 8 at the Joshua Tree Retreat Center, a popular destination. With two kirtan stages, three yoga halls, a breathwork hall and over 100 conscious vendors, Bhakti Fest is the largest event of its type, features something for all devotees, night and day. Music is at the core of Bhakti Fest. 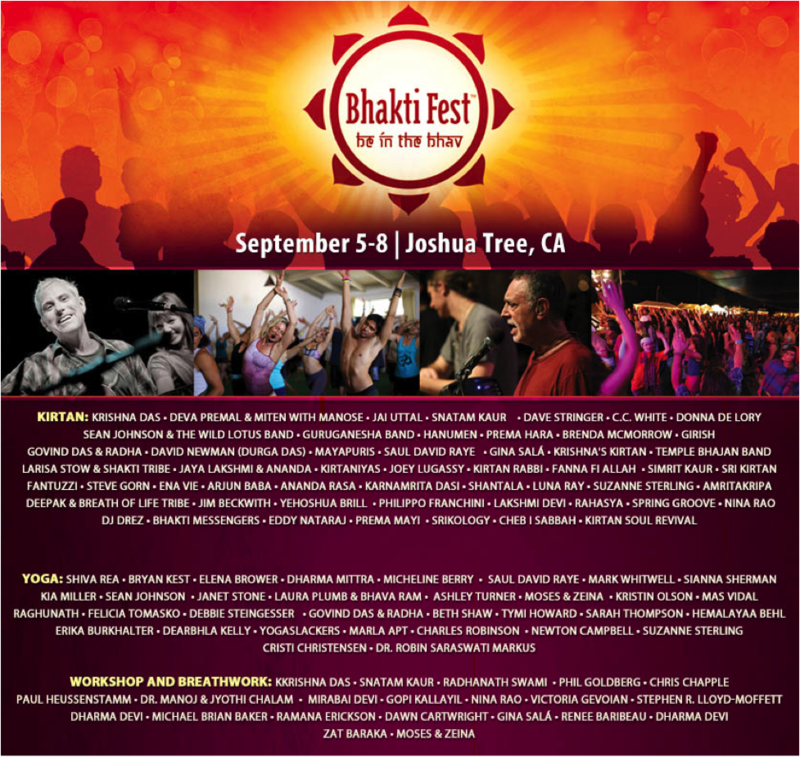 Since its inception in 2009, Bhakti Fest has brought together the top kirtan artists and the 2013 lineup is no exception. Attendees will have the opportunity to experience devotional chanting, along with over 50 nationally acclaimed musicians performing non-stop for the entire four-day festival. These devotional chants of love will ring throughout the hills of Joshua Tree. All of the top performers in the genre are scheduled: Krishna Das, Deva Premal & Miten with Manose, Jai Uttal, Snatam Kaur, Dave Stringer, Donna De Lory, C.C. White, Sean Johnson & the Wild Lotus Band, Govind Das & Radha, David Newman (Durga Das), Kirtan Rabbi, DJ Drez, Arjun Baba, Karnamrita, Deepak & Breath of Life Tribe, The GuruGanesha Band and many more. Kia Miller, Saul David Raye, Hemalayaa Behl and many others. With over 20 workshops on a wide variety of spiritual themes, Bhakti Fest brings the physical asana and chanting practices into greater context for attendees. Each day features sessions geared to educate and inspire with some of the most formidable guides of our time, including Krishna Das on the “Heart of Devotion,” The Journey Home author Radhanath Swami, Philip Goldberg on “The Beatles Yoga: Let it be,” Google+ for Brands Evangelist Gopi Kallayil, Michael Baker on “The Resolution of True Intimacy & The Unification of the Atman,” Zat Baraka on “Manifesting Our Lives Through Self-Initiation: A Tantric Breathwork Workshop,” and many more. 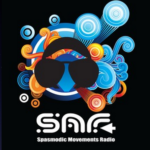 Bhakti Fest’s spiritual godfather Ram Dass has filmed a special two hour interview with festival founder Sridhar Silberfein that will be played each night of the festival. This intimate video is the fifth in a series of “Conversations with Ram Dass on Contemporary Thoughts” which is soon to be released as a book. All four other parts can be viewed at http://bhaktifest.com/bhakti-fest-exclusive-interviews-with-ram-dass/. Bhakti Fest provides a complete physical, mental and spiritual health experience including a healing sanctuary with massage, bodywork, energy work, and other unique wellness enhancing modalities. There are a variety of raw, vegan, vegetarian and other high vibrational food and beverage options available. Additionally there is an extensive marketplace with eco-friendly vendors offering yoga gear, clothing, devotional art, musical instruments, CDs, crafts, jewelry and much more. There will be two separate ticket intensives around Bhakti Fest 2013, a pre-festival intensive with Saul David Raye and a post-festival intensive with legendary yoga master Dharma Mittra. The Joshua Tree Desert Retreat Center, is the perfect setting to foster inner reflection and spiritual reconnection because of its peacefulness and natural desert beauty. Accommodation options include en suite rooms with baths, camping and RV parking, all on site. There are also several hotels within a few miles of the retreat center. Tickets for Bhakti Fest 2013 are available at www.bhaktifest.com. The festival donates monies to a variety of non-profit organizations including Food for Life, Love Serve Remember Foundation, Ramana’s Garden, Seva Foundation, Share Your Care, and Woman’s Earth Alliance. Bhakti Fest is a festival series which celebrates the devotional path that has its roots in yoga, kirtan, and meditation. It embraces ancient and modern sacred wisdom and traditional and non-traditional spiritual practices. All the artists, presenters, and vendors embody, practice, and share the spirit of Bhakti through a variety of ways, including continuous kirtan, yoga classes, meditations and prayer, teachings and workshops, fire ceremonies, an eco-friendly, holistic marketplace, vegetarian, vegan, and raw vegan cuisine, a wellness sanctuary including massage, bodywork, energy work, intuitive readings, and other unique life enhancing modalities. Bhakti Fest encourages the spirit of service and offers a work exchange program. The festival donates monies to a variety of non-profit organizations which provide food, education, and environmental beautification programs around the world. Some of the many sponsorship program participants Bhakti Fest appreciates include New Chapter, My Yoga Online, Coconut Bliss, Namaste Interactive, Desert Essence, Earthrise Spirulina, HealthForce Nutritionals, Organic India, Reeds Kombucha, and White Swan.